Precision assembly imported high quality movement, stable performance. 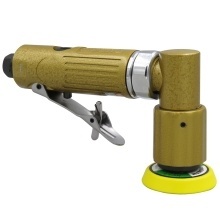 High hardness fine steel movement, CNC precision machining, rotates smooth and stable. Small grinding disc, easy to operate even in the small space, leaving no dead angle. Lightweight and low vibration, the grinder is easy to operate and high efficiency. Apply in iron industry, wood industry, tire industry, shipping industry, mold industry, shoe industry, manufacturing industry, etc. Wide application in mirror processing, metal surface grinding, polishing, descaling paint, solder polishing.